I’ve always loved this film, but felt that the slow pacing, forced romance, over-the-top religious points of view, and somewhat disappointing ending made it far less than it could have been. With this edit, I hope to make the film into what it always should have been. I first attempted an edit of Contact 2 years ago, but lack of time and other concerns prevented me from finishing that first attempt. Now, with more time and a far greater skill set for video editing and compositing, I’ve worked consistently for over a month to create this new version using many of today’s top editing tools. When I approached this edit, I first identified the various “problems’ I desired to overcome with the new version. The somewhat disappointing ending is where my thoughts first landed. I have always felt that Ellie Arroway’s amazing experience in the film was overshadowed by all the nay-saying, commission hearings, etc. A woman receives an incredible message from another world and is transported xyz light years from our own galaxy for a rendezvous with an alien life form, only to return and be grilled by Congress on national television as if she’s some sort of criminal. Some people feel that happy endings are clichÃ� these days, but I think an inspired ending filled with awe and hope is just what this film needs. I have restructured the flow of the story so that we get some of the nay-saying out of the way right from the start. This new version opens near the end of the original film, with Ellie’s return and the fallout surrounding the question, “Did she go, or didn’t she?” I’ve shortened the hearings to a single scene that I feel sums up the argument for and against the truthfulness of Ellie’s claims. From there, we travel back in time to Ellie’s childhood, where the story proceeds differently from the original. All of the childhood scenes now appear together, rather than being interspersed between “present day” scenes. With the pains of childhood behind us, the story moves into a higher gear much earlier than in the original film. Next on my list of improvements was to tone down as much as possible the romance between Ellie and Palmer Joss. I won’t go into details, but I’ve removed almost any hint at romance between the two of them. Now they just seem like really good friends. A small peeve of mine was the compass passing back and forth between Palmer and Ellie several times. In YANA (You Are Not Alone), Palmer gives Ellie the compass and it never changes hands again. Next on the “hit list” was the pacing of the film. Many people felt that it was too slow, taking too long to get to the interesting stuff. In a way, I agree, although I do have an appreciation for the meticulous pacing of the original. Through careful experimentation and a fair bit of trial-and-error, I’ve been able to prune several scenes without affecting the story in a negative way. Ellie receives the “message” nearly 20 minutes earlier in the film, and the pace only picks up from there. I always felt that the opening, a 3-minute backwards journey from Earth to the star Vega, was much too long. I haven’t cut the scene from the film, though. I just found a new way to use the footage involving some careful time remapping. The entire sequence appears twice in the film, but both instances combined run at less than half of the original scene’s length. Another sore spot with some viewers of this film is the over-the-top science vs. religion theme. I’ve removed some, but not all of it. I experimented with a version that removed the Christian terrorist subplot entirely. That necessarily excluded the existence of the first machine. Without the first machine, there would be no “machine seat” for David Drumlin to win by pleading to the religious and moral “consciences” of the committee. In the end, the version without the first machine and religious subplot was rather boring. The trials Ellie must endure to get what she deserves provide the conflict at the very heart of the story. With this in mind, I decided to leave the first machine and terrorist subplot intact, but resolved to tone things down as much as possible. Ellie never sees the religious terrorist at the rally outside the VLA (Very Large Array). She first encounters him as she arrives for the committee reception. In all, I’ve removed some of the more annoying religious references. But to keep balance, some of it remains. Through editing this film, I’ve become aware of the care one must take not to fracture a storyline for the sake of saving a few minutes of film runtime. Some people are also bothered by the character S. R. Hadden in the movie. Personally, he’s one of my favorite characters. I tried versions with and without him, but ultimately decided to leave him in because of the gaping plot holes that would be created in his absence. When “improving” a film, I feel it is important not to make matters worse by excising too many things. There’s an old saying, “If it ain’t broke, don’t fix it.” There are several scenes in Contact that are perfect (or nearly perfect) as they are, and so I’ve left them largely untouched. I believe it is a faneditor’s duty to recognize when something is good and let it be, rather than changing something simply for the sake of changing it. As a result, the middle 45-percent of YANA largely resembles the original. Nearly every scene has been tweaked and tuned a bit here and there, but some scenes are simply fantastic the way they are, and don’t need any help. As Ellie approaches her rendezvous with the alien, the filmmakers chose to do some weird warping of her face. I guess they intended to imply that Ellie had seen something so spectacular that even a gifted actress like Jodie Foster couldn’t portray the emotion properly. Shame on them for tainting her performance with obvious face-warping that looks strange and detracts from the impact of the moment. All of the face warping has been removed, except for a small portion that was actually done well and adds something emotionally satisfying. I’ve always been bothered by the strange coloring of the “alien beach” scene. The alien creates surroundings that remind Ellie of Pensacola, Florida. But as a child, Ellie didn’t draw Pensacola with a pink beach. Hers was golden. I have a feeling that the filmmakers were trying to give the scene a mystical or ethereal feel by using such strange colors… Personally, the scene just hurt my eyes as well as my sense of color balance. The skin tones were too red, the trees were too green, and the beach was pink! I’ve completely recolored the alien beach scene to more closely match young Ellie’s drawing of Pensacola. No more overly green trees, and no more pink beach! Since, at the beginning, I took care of some of the things that annoyed me about the original “letdown” of an ending, I was free to construct an entirely new ending that is more hopeful, an ending that leaves us on a high rather than feeling like we’ve just been dragged through the mud at high speed. For the ending, I created a special 6-second sequence involving the star Vega, using After Effects. - A new dedication to Carl Sagan (author of the original book) at the beginning of the film. - Cut a fair portion of the CNN news footage, but left in any such footage that helps the story along. - I’ve removed most of President Clinton. Love him or hate him, who wants to listen to a politician ramble on when the main character has received a message from another world! - Many small cuts here and there, to keep the story moving at a more even pace. - Not a part of the film itself, but I added a small nod to Back to the Future, and director Robert Zemeckis (who also directed Contact) in the DVD menu transitions. Some might find it a bit cheesy. Others might not. - Used a handy little freeware audio plugin called Knockout to remove the music in several key scenes that I wanted to rescore with music from the Blu-ray isolated score. With a bit of care, one can remove most of the music with little degradation of the remaining audio. In all, I’ve managed to cut 37 minutes from the film without leaving plot holes or unresolved subplots. I was careful and held in mind my goal of a complete and satisfying story while I was experimenting, cutting, and recutting. I created fully animated motion menus for the DVD, the centerpiece of which is a representation of the wormhole Ellie travels through on her journey. The DVD also has chapter selection menus with motion thumbnails for each chapter. The original source material came from the Contact Blu-ray. But even so, a bit of excessive graininess was apparent here and there. To fix this, I used the remarkable noise reduction plugin, Neat Video, on a mild setting to remove the excessive grain. I think you will find the picture quality of this edit to be exceptional throughout the film itself as well as the DVD menus, etc. I’ve taken great care to make sure this release is as polished as possible. I’m sure that in time I’ll remember more of the changes I’ve made to the film, but this incomplete list will have to do. I’ve taken great pains to make Contact: You Are Not Alone as enjoyable as possible. It was truly a labor of love. Contact is one of my favorite films. I hope you enjoy my work. I found this edit to be a bit of a letdown. I’ve read the book twice, seen the movie probably four times since its original release, so I was excited by the prospect of a fanedit that addresses some of the film’s shortcomings. However, I found the restructuring of the beginning and ending to be ultimately ineffective. The fade from “that’s a good answer” to the capsule’s splashdown was very abrupt. It did not feel like a natural transition. The scenes following Ellie’s return and the Congressional hearing do not feel like the beginning of a movie. They have the narrative complexity and weight of post-climatic scenes. Maybe it’s because I’ve seen the movie already, but these scenes just feel out of place, as though reading the last chapter of a book first. Yes, putting them up front gets rid of the “bummer” ending, but instead now you spend the whole movie knowing that Ellie’s journey is going to be met with incredulity and downright hostility. It casts a pall over the entire film that works against any uplifting message it’s supposed to have. Finally, although I really liked the idea of ending on a shot of Vega with the sound of the message, it also ends very abruptly. I would’ve liked the shot of Vega to cut to black, with just the sound of the message pulsating 4 or 5 times, then a beat or two of silence, followed by the credits. That would’ve let it simmer just a little more. I did really like the recoloration of the beach sequence, and the removal of the superimposed smile of awe on Ellie’s face. I also appreciated the excision of most of the romance plot, because I was never a big fan of that either. It’s an interesting concept, and I’m glad I saw it, but I would have to recommend this fanedit only to those who’ve seen the original and were mostly disappointed by it. I would not recommend this edit to someone who is new to Contact. Overall, I rate it a 6/10. I new to the FE review process, so I am still getting the feel of what/how etc to write a good, informative, constructive review. So, please have patience with me. The original “Contact” for me is a great movie. I have watched the original many, many times. I like it so much, that I have taken care to have a great long time between viewings before I watch it again. I don’t want the experience to become mundane for me. Having said that, this edit had perfect timing for me and my desire to watch “Contact” again. I really liked the new opening of this edit; where Ellie is taking the school children on a tour of the VLA. I felt this opening, more than anything else in this edit, really sets up a feeling of hope and excitement that not only the movie is going to have overall, but for Ellie herself. I did not really like the next two scenes: Ellie returning from her voyage and then the Senate hearing with James Woods. Although these two scenes are very brief, I think they are misplaced in the edit (IMO only). I think the tour scene at the beginning, then Ellie on her ham radio as a child would be much better for the flow of the edit and in keeping with showing Ellie’s penchant for discovery and intelligence. I think the two scenes after the tour give away too much. They reveal too much about the plot. Please don’t take this as harsh criticism, because I really enjoyed this edit immensely in the long run, really. Also, because of the way the edit now ends, I just don’t think the entire Senate hearing is really necessary. I never realized how much I would NOT miss the whole romance and religion aspects of this movie until this edit. I think the movie works very well without these sub-plots. I was very amazed about this as I knew going into this edit they were removed. Removal of these sub-plots, IMO, makes the movie much tighter and less slow/static. Bravo! Now for the ending of the edit: after she sees the alien-her father and is about to return to Earth, the edit fades to black then cuts to the Kitz/Constantine (James Woods/Angela Basset) scene discussing the recording of the 18 hours of static, then ends with the final portion of the school children tour. I found this ending to be VERY effective and ties very well in with Ultimist’s vision of hope (not sure if he intended that or not, but it certainly shines through). The manner in which Ultimist edited this, I just don’t see the necessity of the Senate hearing, “we don’t believe you Ellie” sub-plot. I like the audio overlay and the galaxy shot at then end – very well done and perfectly ties into the theme of the movie. In fact, I made a copy of this FE for my father-in-law (big fan of the original too). I will be eager to hear what he thinks of the “Senate hearing scene” as well. VIDEO: Perfect quality. Exactly what an FE should look like. I streamed this wirelessly form my network (via Dual wireless N) to a new OLED 55inch TV and it looked amazing on my TV. I really saw no video issues at all. Very sharp, clear, deep and good color correction. Overall, I liked what I saw. Near perfect editing/cuts. However, there was one very glaring cut/edit that I noticed as soon as it happened (I re-watched this portion again just to make sure it wasn’t because of my corrupt version form last night). The scene at the Arecibo party with Ellie, Palmer Joss and Drummond. Drummond walks away after an exchange of barbs with Ellie and Joss; Palmer Joss then turns to Ellie and says he has ruined his chances at an interview with Drummond, the scene harshly cuts to the next one. The audio is very rough here, between the cuts. It doesn’t detract form the overall quality of the edit, but it is there. Also, there seems to be a little issue with an audio cut when Ellie is trying to get back to the VLA and is driving through the madhouse of the RV park/town/gathering — during the “Purple People Eater” song area. I might be wrong on this. I need to go back and watch my DVD to verify if it is like that in the original. If it is, I will make sure to retract this part of my review. I noticed no areas in the scene edits that I called “flashing” – it is where a scene has been edited but maybe a frame or two remains of the original and causes a very quick/brief flash at the transition from the cut to the next scene (not certain if I ma explaining myself correctly). I thoroughly enjoyed this edit. I eagerly anticipated this and was not disappointed. My apologies Ultimist if I harangued you too much to get the links to work! Even the above few “negative” things I mention, ultimately did NOT affect my enjoyment of this edit. Does this replace my original DVD? Yes and No. For me, I absolutely love the original version and I absolutely love this edit. For me, I now have two versions of a great movie to add to my library. Think of this (for me): it’s like one of my favorite books being made into a movie – love them both for different reasons and can’t compare them to each other – they both are stand-alone great things! 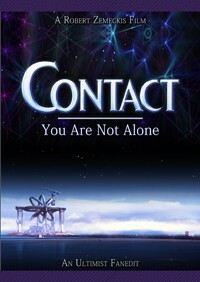 PS–Yes, Carl Sagan’s book “Contact” is also one of my favorite books. So, I now get to have THREE versions of this material! Excellent! This FE, too me, epitomizes, what this community is all about. I highly recommend this edit to all. Well I just finished watching this and overall I think it was very well done. Presentation: I thought the DVD menu design was great. It looked pretty darn professional (in my humble opinion ). Movie: I liked the opening, but I have to agree with UnknwnFactor in that the Senate hearing was not necessary and actually showing the aftermath of Elle in the pod gives too much away. Although I’m not sure how the editing would have to be changed in order to do this. So I respect your choices. Getting rid of the romance and God/religion aspects was great and definitely helped the pacing tremendously. The ending was well done and it is nice that it comes full circle at the end. Video editing: Im not a seasoned editor but in my amateur opinion the editing was pretty flawless. The image quality was pretty amazing. (Within the first 10 minutes of watching, i paused and went back to the thread in the forums concerning the fanedit, to see that you were using the Blu-Ray source). Audio editing: There was nothing jarring that stood out to me. Overall I would rate this a solid 8/10. Great job.